A former city mayor has been jailed for nine months after being convicted of vote-rigging. Labour's Mohammed Choudhary, 49, former mayor of Peterborough, Cambridgeshire, was jailed at King's Lynn Crown Court. Party candidate Maqbool Hussein, 52, was jailed for three months and Tariq Mahmood, 40, received a 15-month term. All three from Peterborough, were convicted of forgery over a scheme to fabricate votes for the Peterborough city council election in June 2004. The four-month case cost the taxpayer £850,000 and all three defendants were granted legal aid. 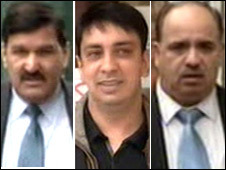 The judge ordered Choudhary to pay £20,000 towards his costs and Mahmood to pay £15,000. He did not make an order relating to Hussein. "They were able to get hold of postal and proxy votes which belonged to voters in the central ward," prosecuting QC Anthony Leonard said. "They arranged for postal and ballot papers to be sent not to the voter but to addresses with which each defendant was connected." Detectives began an inquiry after voters complained, jurors were told. Choudhary and Hussein were Labour candidates in the election - and neither won seats despite the scam. Mahmood was a local Labour party secretary. Det Insp Ian Tandy said he was satisfied with the length of sentences. "This hopefully will act as a deterrent and send out a message that election fraud will be investigated and prosecuted," he said.